Skiing for intermediates in the USA. If you’re confident with the basics and keen to clock up cruisy miles and expand your experience, this list shows our favourite stateside mountain resorts for intermediate skiers and snowboarders. See your technique and love for the mountains soar, with motorway groomers to boost confidence and build a rhythm, renowned ski schools to provide pointers and world-class facilities all round. Worlds away from Aspen in cost and character, but only 9 miles away by location – Snowmass lives up to its name with LOTS of the white stuff, when it comes to both pistes and powder. To ski or snowboard in one of the best intermediate ski resorts in the USA, choose from our carefully selected list of resorts above. America’s intermediate-friendly mountains mentioned here have at some stage held titles like "best US Intermediate ski resort". 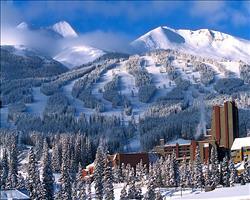 When it comes to intermediate skiing in America, these ten resorts are our favourites. Beyond the States, you can view our Top Ten resorts for intermediates in Canada and in Europe, our favourite places to ski in Austria, France, Italy and Switzerland. There’s also our list of best intermediate resorts in the world, for the ultimate intermediate ski holiday.